Q: How do I apply to the CUPRA Training Program? Q: Can anyone join the CUPRA Training Program? A: Although we do everything in our ability to accept all interested individuals, enrollment is limited to individuals looking to embark on a new career path in psychiatric rehabilitation. The entire course will be limited to a small but specialized group. Q: How long is the CUPRA Training Program? 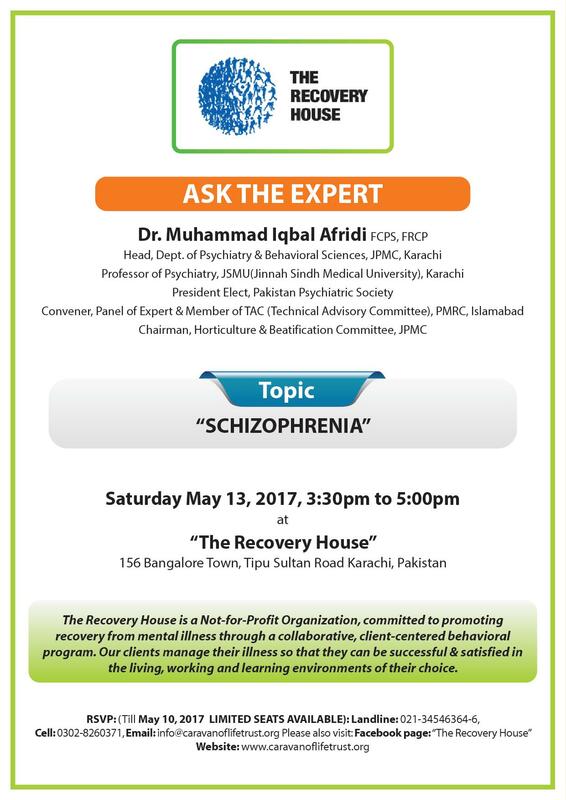 A: It is a 12-14 month long education program including the Psychiatric Rehabilitation Association’s required hours of work experience. Q: How will I receive my training? 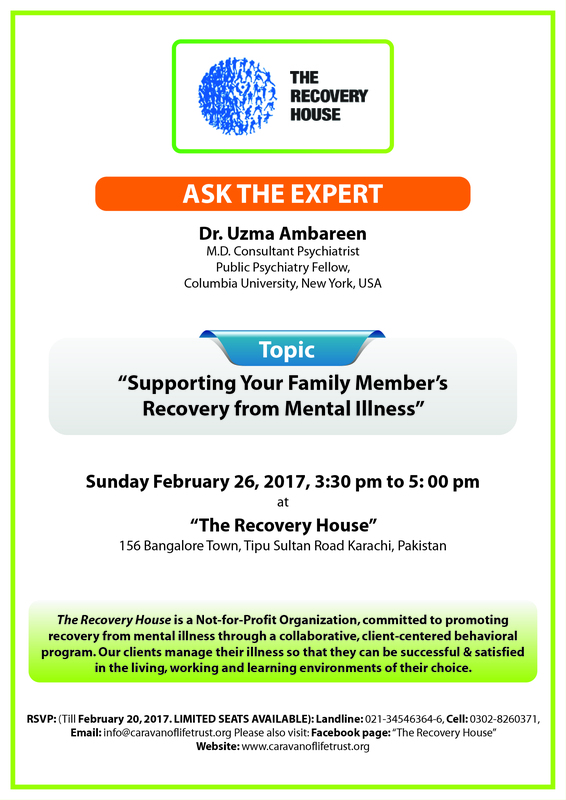 A: Training will be undertaken at The Recovery House in three ways. 1. Lectures given via Skype by American Trainers with a question/ answer session. These will be followed up by participant group discussions & reviews, required readings & independent research ending with a pass /fail quiz for each session. 2. Webinars will be viewed in classroom style which will be followed up by discussions with the American expert on Skype. All webinars have a built in pass /fail quiz. Q: How will I get my Certificate? A: CUPRA does not give certificates. CUPRA Trainings prepare you to take the Certification exam by meeting all their course requirements & work experience. The only certifying body for the CPRP certificate is The US Psychiatric Rehabilitation Association (PRA). Q: What is the benefit of certification to me in Pakistan? A: Holding the CPRP credential offers increased opportunities for employment, mobility, career advancement, professional credibility and more, because it is increasingly being recognized across the world .Certification identifies a practitioner as having achieved the required level of knowledge and skill in the field. Maintaining PRA credentials through continuing education and recertification reinforces this notion and identifies CPRPs as current and professionally competent to colleagues, employers, agencies and the public-at-large. Q: How much does the CUPRA Training Program cost? A: The Registration Fee is Rs. 5,000 which is non-refundable. The full fee for the 12-14 month course is Rs. 150,000. Varied terms of payment are available. Financial aid & Scholarship to Qualified candidates may be available. Q: What happens when I miss a session of the course? A: We will make every endeavor to help you make up the missed course credits required by making available additional webinars at the end of the course, however excuses for missed sessions must be approved by training supervisor. Q: What do I do if I am unable to attend my class? A: We expect participants to notify us if you are unable to come to your session that day. Application to abstain from session must be approved otherwise make-up session will not be provided. Q: What exactly is a contact hour? A: For the purposes of the CPRP credential, PRA calculates contact hours rather than CEUs. By definition, one contact hour is equivalent to one hour (60 minutes) in the classroom.